Thanks for visiting with us today during the Mega Blog Hop for JustRite featuring Fonts. JustRite is celebrating their Mega Font Hop in style (a 2 Day Event with 54 designers) with a Super 7 Day Font Sale. Take 30% off all JustRite font sets as well as the Horizontal and Vertical Font Stampers. Sale begins Sept 17th and ends Sept 24th. I developed a set of cards to file away with the old Christmas cards. As file tabs I used Spellbinders Fancy Tags and stamped the date on each tab with Justrite Brayton Font. Keep in mind…there is Mystery Blog Candy being given away during the Two Day Just Rite Font Blog Hop!!! 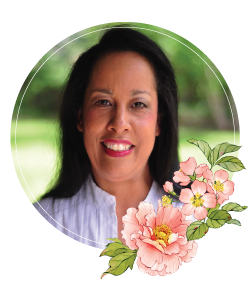 Why is it a Mystery…..well, there will be 3 blog candy giveaways on each day and you can only win by leaving a comment on the right blog! The real surprise is you won’t know which blog has the candy…..even the designer doesn’t know! So as you visit each of the 54 designers over the two day event take time to leave a comment…..who knows, the lucky winner may be you!!!!! You have until Sunday at noon to leave a comment for your chance to win. Then check back at the JR Blog on Sunday evening to find out who won!!!! Enjoy the Hop, get ready to see some amazing stuff! Love the idea, will definitely have to tinker with it, so I can make something amazing of my own. This is very nice, thanks. What a great way to file your Christmas info. I love the tabs. Becca, This is amazing! I open up your site every day for inspiration and today when I opened it I gasped at how gorgeous this was and then to find out it was something so useful too! AMAZING! Becca. I really love your use of the Fancy Tags. I really need them. I also love the Just Rite lettering. Thanks again for the inspiration! Gorgeous…you can have this out displayed on a table and no one would know what it is :) It just looks so elegant. Heavens above Becca, you’ve done it again – another fantastic project! How you keep thinking them up goodness knows! Your blog gets better with every passing day. AMAZING Paper Grace indeed!! This is totally beautiful!!! My jaw is on the ground! You are SO amazing! I’m in awe every time I see your creations! OK Well I thought I was a pretty good Card crafter! I see I have A Lot to Learn. Becca, I’m hooked. You have a regular Fan. 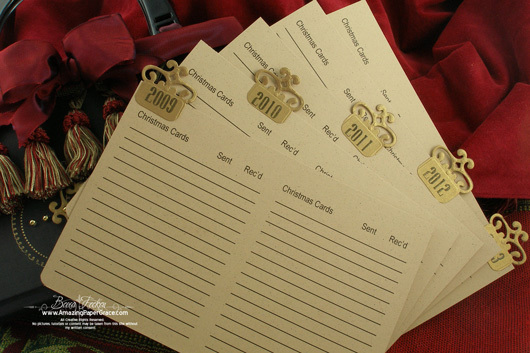 What a great idea to keep track of all your Xmas cards! The personalized words are so easy with the Just Rite stamps. Beautiful job. Love it! your work is remarkable , thank you for sharing . WOW! Another great project. I like to stop by often to see what you have made. I’m never disappointed! oh I want one!!! that is so pretty, elegant and everything else nice. Oh, my gosh! 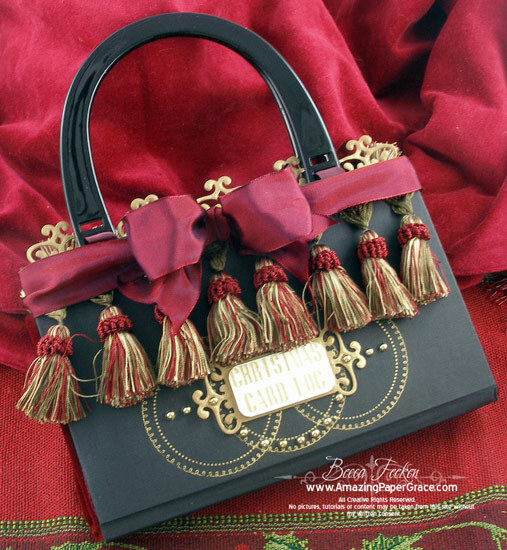 This purse is absolutely gorgeous with a capital G. What a great organizational tool, too. Still trying to figure out how you did the gap with the velvet. You win the Gold Medal on this project! Becca, this is just outstanding. I love everything about it from the colors to the design. You are so creative as usual! Becca – this is fabulous and what an idea – WONDERFUL !!! Can we say over the top. I LOVE IT. I never would of thought of doing this myself. 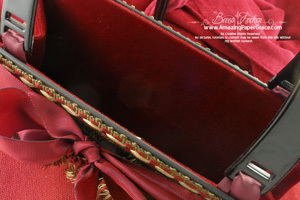 Love your use of JR products, Spellbinders, paper, velvet, everything. What a great gift! Every bit is perfection! The lettering is perfect for this project. OK, you are the most wonderful/over the top girl I know. I love this project. I can think of a dozen ways to use the little folder and the tabs. Becca, This is adorable, I love coming here. Just fabulous, I wish my brain was as creative as yours! What a great idea Becca – not only gorgeous, but practical with it. Love the log! This would also be a great card box for a special friend! Your work is beautiful! I love coming to your blog each day. Thank you! What a wonderful idea. I always need something to keep track of cards that need to go out during the holidays. This is so wonderful, I really need to make this , also would be great for Birthdays that I have to make cards for, or even special cards though out the years. Becca, this is a super idea. I like it so much I will be making a few for Christmas gifts. You are always challenging me . Thanks…….. so much. The challenge would be easier if there was directions for the folder. I need all the help I can get. Crazy good! You can do it all! You are so amazing. What a great way to stay organized for the holidays. Thats Beautiful Becca !!! I am regularly overwhelmed by the creations you demonstrate. I enjoy your CALM tone and how you make each projrct approachable. I haven’t moved up from Card crafting yet but I think You will be the motivator I need. Love your AmazingPaper Grace Too ! WOW Becca – another stunner!! What a lovely gift idea and so beautifully done. tfs. Whew! I thought I was never coming to the end of all the comments. No wonder…your card file is spectacular. Such a fantastic idea. And the way you have decorated it is beautiful. Love the tassles and the way you have used the Fancy tags. Beautiful as always. You always have such inspiration! I LOVE, LOVE, LOVE your Christmas log. You are such an inspiration to all of us. Please don’t ever quit. You continue to blow me away! I am amazed, as usual, with your creativity! This is so beautiful…thank you for sharing with us! This would make a lovely gift. Becca, I just don’t understand this blog hop. I tried posting on the other girls blogs but it doesn’t let me. I don’t understand stand how to post on there blogs. I must be brain dead. LOL. Becca, I am having trouble as well. I have even join goggle…(?). And still it won’t let me. Is there something that I am not doing right. another wonderful creation! Love this ‘altered book’! I may have to give this a shot with all the freebie books I pick up. Since I don’t track cards, maybe I could make it a sample card holder…. Your projects are always so beautiful! Thanks for sharing! Wonderful work, Becca! What an inspiration! TFS! That is incredible, does not look like an old book! Just when I think you have come up with something spectacular, you trun right around and come up with something even more fabulous. what can I say? As usual your work is absolutely stunning. Thank you so much for sharing. Wow, what a creative idea you have come up with for what the 1000th or so times. Very pretty and elegant too. The just right stamps really confuse me..LOL, but I love what you do with them! Absolutely gorgeous cards!!! Becca, your blog is what I look forward to every day. When you’re having computer problems, I’m crushed. Just want you to know how much you’re missed when you can’t make it.